This Dyno test was run on a stock 80" Evo w/ open airbox and our 2/1 Nostalgic header with our torque core insert, by Tilly's Harley Davidson against stock on an 80" EVO. Compliments of Iron Works Magazine. (AMS) Anger Management fuel control module for Harley Davidson all models with EFI from 1995 to 2018. This is a plug in and play unit, no splicing, Fully tunable, user friendly and programmed with richer baseline to run with our high performance exhaust. Easy to install, and easy to tune without the expense of dyno tuning! 2018 Softail Mayhem, our newest addition to our Mayhem line of exhaust! Loud & Rowdy and lots of power with a custom style that we are known for, we introduced our Mayhem line 12 years ago. Fits all 2018 & 2019 Softails, our options include choice of Slashcut or Turnout Collectors and Heatshields, use our pull down menu for choices. The Mayhem has the 12mm 02 ports. With the added power we recommend our AMS fuel tuner which is setup for our high performance exhaust, other tuners will work, but need to be tuned with our exhaust. Our Mayhem line has a proven record of having nearly unmatched Dyno numbers. This is a complete performance system Made in the USA. Fits Street Bob, Low Rider, Slim, Fat Bob and Deluxe. There are sound clips on our Facebook page and our You Tube page. Our 2018 Softail Track Tuned Header adds a big power boost, same top end Horsepower as our Mayhem but with much more in the mid range. Deeper exhaust note than our Mayhem but not quite as loud. Our T/T header comes with Designer heatshields, 12mm 02 sensor bungs and easy install. If hard hitting power is your thing then you'll love this, it RIPS, really brings the Milwaukee 8 to life. Sound clip on our You Tube and Face Book page. This is a complete performance system built in the USA. Fits 2018, 2019 Street Bob, Low Rider, Slim, Fat Bob, and Deluxe. Fits 2007-2017 HD Softail models, including Slim, Fatboy, Heritage, Deluxe, Comes standard with Black Ceramic Headpipes, black ceramic Designer heat shields (with the holes) .Other finish options are available. Your choice of Black Ceramic or Triple plated chrome collector. Has 02 Sensor ports. Our new H-D Mayhem collected system, puts out great power and fantastic sound, its one of the best performing exhaust available! see our Facebook page for sound clip. NOW AVAILABLE FOR THE 2012-2017 Softail's with 12mm 02 ports! We recommend using our AMS for proper Air/fuel ratio, this is critical for our High performance exhaust, please see our AMS description. Harley Davidson Softail 86-2006 "Mayhem" header system. Not only will our Mayhem add great looks to your bike, but it also puts out HARD hitting power. The powerband starts just above idle and RIPS into the Mid range, with power all way past redline. Comes standard with Black High temp headpipes with black High temp heat shields, other finish options are available. Your choice of black or chrome collector. Super price, super looks, super sounding. Softail Medusa Header 207-2011. Softail Medusa Header 2007- 2011. If you want power, our Medusa will give your bike that & more, we are avid riders, so we develop our exhaust to give the riders power where its needed, power builds below 2000 with meaty midrange & top end. Our Medusa has a very deep tone that is not overly loud at idle, crack the throttle and you know this exhaust puts out power. Our Medusa comes with the 18mm 02 ports, Designer Heatshields (holes) and billet tip, please use the pull down menu for chrome or black finish options. Our Medusa fits Softails 2007 -2011. Made in the USA. Softail Medusa Header 2012-2017. If you want power, our Medusa will give your bike that & more, we are avid riders, so we develop our exhaust to give the riders power where its needed, power builds below 2000 with meaty midrange & top end. Our Medusa has a very deep tone that is not overly loud at idle, crack the throttle and you know this exhaust puts out power. Our Medusa comes with the 12mm 02 ports, Designer Heatshields (holes) and billet tip, please use the pull down menu for chrome or black finish options. Our Medusa fits Softails 2012 - 2017, 2014 & later will require a non stock air filter, we recommend & use the SE heavy breather on all of our Harley's. With the added power a fuel tuner will be required, we highly recommend our AMS fuel tuner, this is made by Dobeck performance and is a modified EJK. War-header for the 2012 - 2017 H-D Blackline, Slim, & Fatboy models. Our War-Header uses a 2 1/2 " dia Tuned chamber design for the best street performance available, For 2012-2017. Our war-header has a nice mellow sound @ idle, but when you roll it on has a deep bark, (please see our Facebook page for a sound clip & running video), Brute Power that hits hard from 2000rpms. These come standard with the 12mm 02 ports, and our heavy duty mounting bracket. We recommend using our AMS for proper Air/fuel ratio, this is critical for our High performance exhaust, please see our AMS description. Our AMS is now available for the 2016/2017 models with fly by wire throttle. 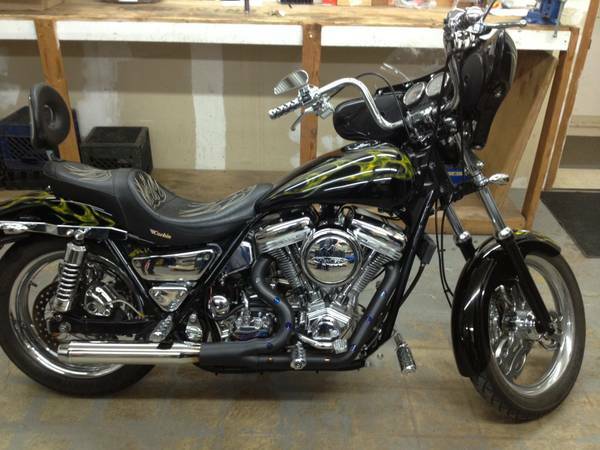 Picture of Our 2016 Slim, all black War-Header with Designer heatshields, 11" muffler & black billet tip. use the customer comment section to add any information that we need or to clarify any options. 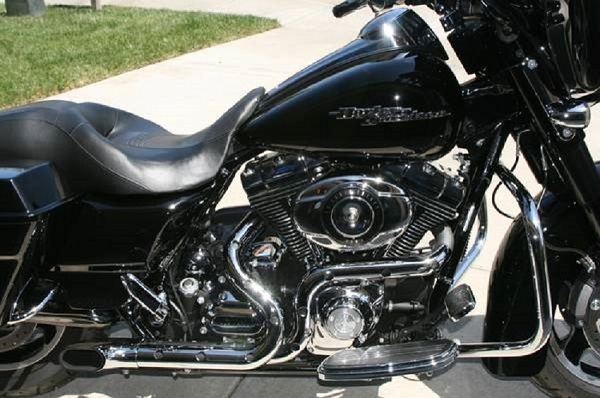 Our Softail War-Header fits, Fatboy, Fatboy Low, Black Line, Heritage and Standard Softail 1986 thru 2011. Our War-Header is Extremely well designed for superior Street performance, we use a tuned chamber muffler for the best mid range & top end power. 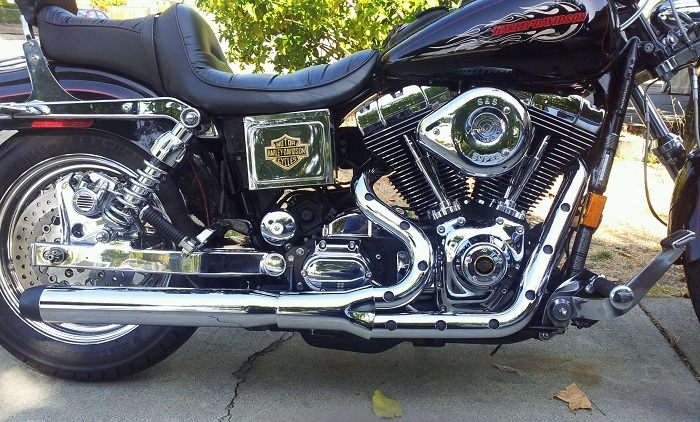 Our War-Header has proven over & over to have the best mid range power of any exhaust. Mid range power is what you need for FAST street riding! Comes in your choice of finishes. Made in the USA. 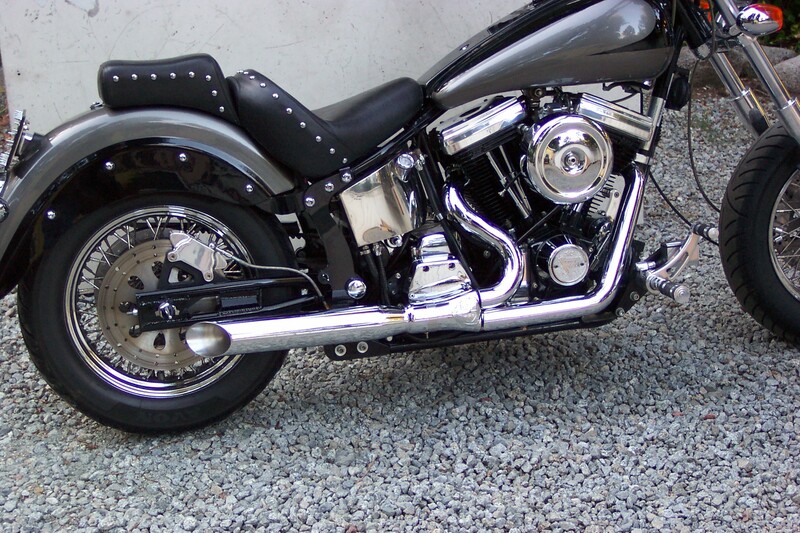 This first picture shows the War-header in black with the chrome Designer heat shields and a 16" inch can on a Fatboy. Length options are 11" inch and 13" inch mufflers. Independent dyno testing has proven that our War-header out performs the Thunderheader and Bassani Road Rage from 2800 rpms and up. The War-Header has a VERY hard hitting mid-range. Please state the year of your bike when ordering! 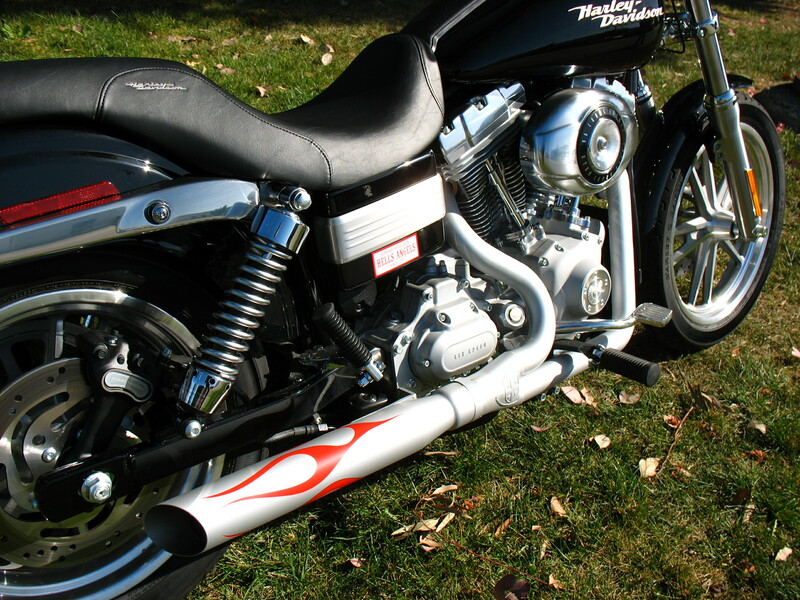 Hacker Custom Exhaust introduces our new style Track-Tuned� 2 into 1 header. We closed the books on our old Style T-T and totally updated the styling and while we were at it, added a hell of a lot more power to it at the same time. With a SE air cleaner our AMS fuel module and our track-Tuned header we pulled 16 more horsepower and 20 ft lbs of over stock. Please use the drop down menus to choose your standard options. On the checkout page there will be a text field where you may add any additional infomation. Now you can have both style and serious performance gains along with a great sounding exhaust. Our NOS Header comes complete with heat shields and all mounting hardware, and whaletail Tip. Combine one of our exhaust and our AMS fuel module and save $120.00 off of the combo. Available in all chrome or all black, or.... We also offer a quiet option for our headers. Our quiet option tuned inserts are approx 96-97 decibels, our standard H-P tuned inserts are approx 103 decibels, (stock pipes are 80, and open straight pipes are in the low 120s). We can can mix and match, heat shields and muffler finishes to give you the looks and Power you want. Picture shows custom turnout tip. Softail High performance Slip-On Mufflers, these fit the 07 up Softail Slim, Deluxe & Cross bones with the stock shotgun headpipes. Easy to install, adding approx 12 hp, Our high performance slip-ons come with High temp Black mufflers with chrome billet tips & muffler clamps. Made in the USA. With the added power, we highly recommend our AMS tuner to add the proper amount of fuel. Finish options are Black ceramic, Chrome, designer Shields, muffler finish. (see top of page). Our War-Header offers superior street performance, show quality finish and looks great on the Dyna! Check out our Facebook page for sound video. 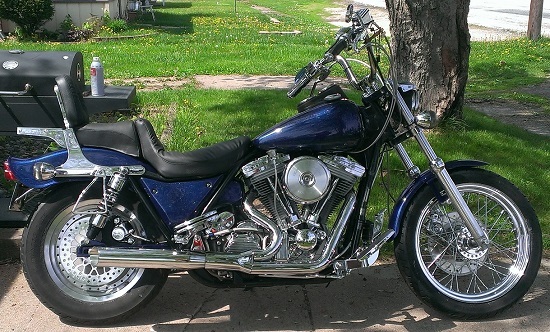 Our War-Header fits Dyna Glides 1996 thru 2005. BEST street performance exhaust available, really brings the power out of the 80" EVO and 88"-95" Twin Cams. Our War-Header has proven on the Dyno to have the best mid range power of any exhaust. Mid range power is what you need for FAST street riding! Our exhaust works extremely well with performance mods. Our War-Header eats Thunderheader & Pro-pipes for breakfast. When your done playing with the Whimpy pipes out there, come check us out! War-Header comes standard with ceramic black pipes & muffler, with black ceramic heat shields and black billet tip. Designer shields and muffler length choices are also an option. Made in the USA Pictures shows a custom finished War-Header! Hacker Custom Exhaust introduces our new Track Tuned Header for the 99 thru 05 Dynas. Our Track Tuned will work either with mid controls or forward controls. Comes standard with heat shields and slashcut muffler tip. We offer options such as designer heat shields, choice of horsepower or quiet option tuned inserts. MUCH more power from 2600 rpms and up than Thunderheader, V&H Pro pipe, Big Raduis and Bassani's Road rage. Very hard hitting mid range power. Has plenty of ground clearance for the riders who like to push the limit, or have lowered bikes. Made in the USA Our standard tuned inserts are approx 103 decibels, (stock pipes are 80, and open straight pipes are in the low 120s). Our Track-Tuned� 2 into 1 Header provides aggressive styling with unparalleled performance with a nice deep rumble. These are set up with the 18mm 02 ports for easy installation on 06 thru 2011 Dyna models. Our Headers have been extensively dyno tested by many shops and our headers have proven to have more power than the Thunderheader, Pro Pipe, Big Radius and Road Rage, with power geared for top end power, This pipe works best with performance mods! 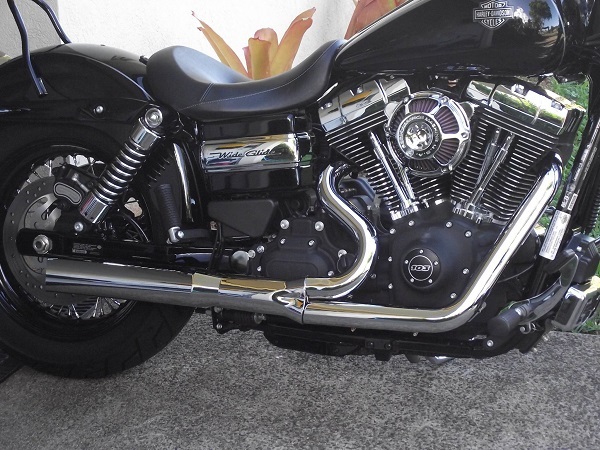 Other manufacturers just talk about performance, Hacker Custom Exhaust delivers performance, so when your done playing with the whimpy pipes out there, give us a call. 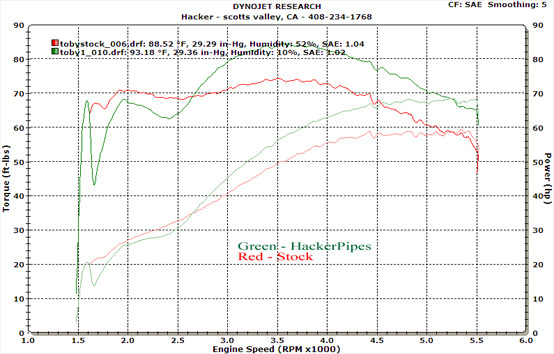 Our Dyna header was dyno tested by one of our vendors, his 07 Dyna put out 16 more horsepower and 20 ftlbs torque over stock, this was with just a remap and breather air cleaner. Made in the USA. No other manufacturer can touch this kind of power increase. "TAKE THE HACKER CUSTOM EXHAUST CHALLENGE:" Please contact sales at Hacker Custom Exhaust for more info. Hacker Custom Exhausts Dyna header is Available in Triple chrome plating or Black ceramic and they Include heat shields. Our Dyna Track-Tuned header comes in black ceramic or chrome with options for heat shield finishes, including our collector heat shield. and slash cut muffler, available in chrome or Black ceramic. NOW AVAILABLE for the 2012 & up Dyna's using the 12mm 02 ports! We strongly recommend using our AMS fuel control module with our exhaust! Please use the drop down menus to choose your standard options. On the checkout page there will be a text field where you may add any special requests not listed here(additional charges may apply). Our war-Header for the FXR adds a BIG power increase, our War-Header has proven over & over to have the BEST mid range power available, mid range power is what you want for FAST street riding. Our War-header starts pulling REAL HARD @ 2500rpms and builds all they way past redline. Note: Please state the year of your FXR when ordering! Hacker Custom Exhaust Introduces our Performance Track Tuned Header for the early FXR's 1984 thru 1987, and the late 1987 thru 1994 FXR's. Our Track-Tuned header out performs the Thunderheader, Road Rage, Big Radius, Pro-Pipe, power is coming REAL strong @ 3000 rpms building to max top end power. We recommend at least adding cams and a good carb when using our Track-Tuned header. The more mods the better our Track-Tuned header performs. Fits with either forward controls or stock mid controls, has awesome deep exhaust tone. Please state year and finish options when ordering. Will fit your 99-2016 Bagger, RoadKing, Ultra-Classic, Street-Glide, etc. Check out our design on the headpipes with our Mayhem collector, our Mayhem will give your bike a total Custom look. The Mayhem comes standard with black ceramic pipes with black heat shields, but other finish options are available. Made in USA The Mayhem has hard hitting power that starts right off idle and rips into the mid range and top end, great for the riders who carry extra gear. Style and power all at a great price! 2007-2009 have the 18mm 02 Bungs welded in. Our Mayhem now has 2 choices of collectors, either HP for max power, this collector has a small baffle for just enough back pressure for a wide hard hitting powerband, or our baffled collector, this cuts the noise level, but still allows good power. NOW AVAILABLE FOR THE 2010 - 2016 BAGGER'S with the 12mm 02 ports!. for the 2014 - 2016 models, changing the stock air cleaner is required, we recommend the Heavy Breather that comes stock on the SE/CVO models. We Highly recommend using our AMS Fuel tuner for proper Air/fuel ratio, this is critical for our High performance exhaust, please see our AMS description. While the Mayhem comes standard in Black, chrome is also an option.